You are here: Home / Age of the Earth / Juvenile Dinosaurs Found Huddling in a Nest: A Local or Global Catastrophe? Juvenile Dinosaurs Found Huddling in a Nest: A Local or Global Catastrophe? We live in a new golden age of fossil discoveries. It seems that every week a new and dramatic fossil find is revealed. This fossil renaissance can be attributed to the opening up of new fossil sources, particularly China and Mongolia but also South America and to improved technology for retrieving and analyzing fossil remains. One such remarkable fossil find from Mongolia was reported in late 2011. * This find involved 15 complete or nearly complete fossils of juvenile dinosaurs all preserved in what was apparently a large 2-3 foot wide nest. That fossil find is described in a research paper which I have read. 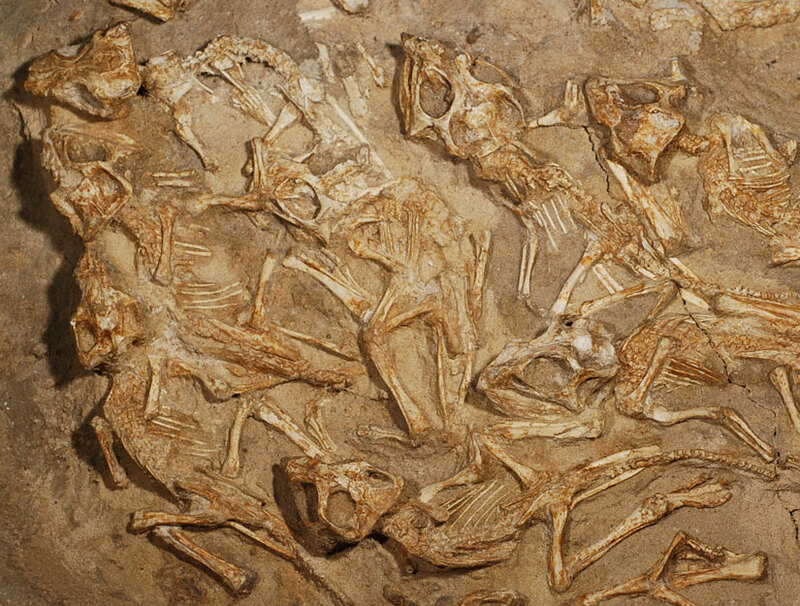 The paper: “A nest of Protoceratops andrewsi (Dinosauria, Ornithischia)” by Fastovsky et al. (2011 in the Journal of Paleontology Vol 85:1035-1041) described the evidence that these dinosaurs were juveniles, that they were all likely the same age and thus were of one brood and were all huddled in the same nest. The significance of this for dinosaur biology is that it evidence that dinosaurs received some parental care after hatching. There was no egg-shell material in the nest and it could be that these juveniles were at least several weeks old. This isn’t just because no egg-shells remained but also because the bones were larger than those found of other fossils of the same species found inside of eggs and so growth of the dinosaurs after hatching is very likely. So, unlike reptiles which hatch and are almost always immediately on their own, at least some dinosaurs seem to care for their young. This isn’t the first evidence of such behavior but it some of the clearest evidence to date. But how where they preserved? The paper discusses in some detail the evidence that these baby dinosaurs were covered by a fast-moving sand storm. The evidence includes grain size in the sedimentary rock and the fact that the sand grins were not found in flat layers but rather in angled layers like in a sand dune as it slowly moves and combines with other sand dunes. The way the sediments were laid down the direction the wind was blowing the sand could be determined and the little dinosaur babies bones were oriented as if the dinosaurs had their backs turned toward the wind to protect themselves as much as possible. In 2011 when I wrote about these fossils I stated that I was sure that within days Answers in Genesis and other creationists would be claiming these fossils as obvious evidence of a global catastrophe. I was absolutely correct and will show you their response at the end. But first let me observe that this obviously this is a case of rapid burial as their is little reason to believe that so many young dinosaurs of the same age would die in the same place and all oriented in the same direction in a nest under anything but unusual circumstances. But rapid burial doesn’t necessitate the jump to global flood. A watery death seems unlikely given that all 15 of these dinosaurs are in one nest, are of the same age (they didn’t just get washed there), and the sand grains of the rock they are embedded have the characteristics of sand dunes found today. A flood, whether placid or violent, would not be expected to result in this kind of preservation. 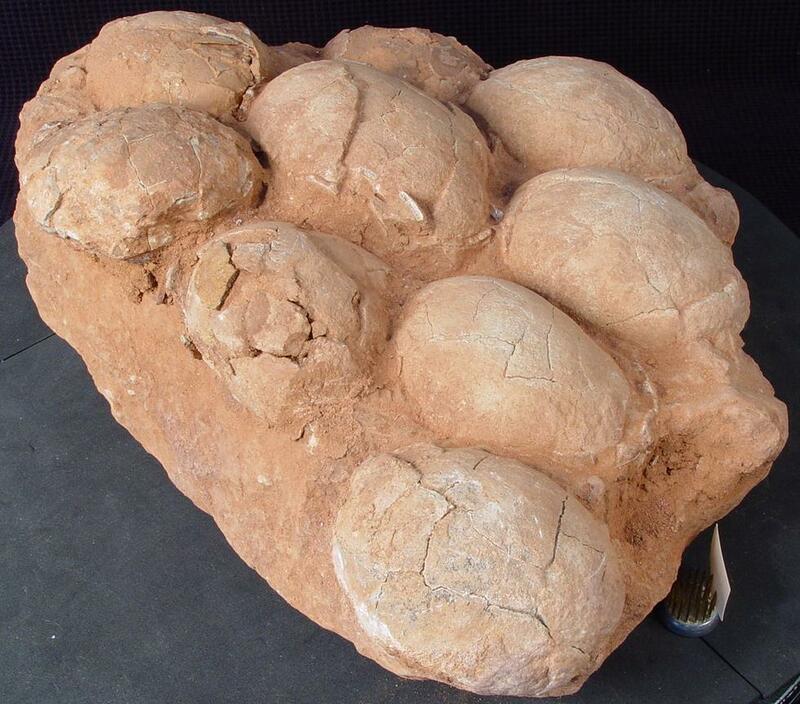 Dinosaur eggs found together in what was likely a nest. Eggs like this have been found in clutches all around the world. Irrespective of a watery or sandy death, the presence of a nest with juveniles in it presents a tremendous challenge to the global flood theory of creationists. Dinosaur nests have always been a problem because, just like this one, they are typically found in layers of rock that are sitting on top of 1000s of feet of sedimentary rock. Young earth creationists hypothesize that these layers of fossil-bearing rocks are the result of a global flood but most also believe that same global flood destroyed the dinosaurs. If this is the case then how then could so many thousands of discovered dinosaur nests with eggs in them (see image for an example) be found in layers in the upper portion of the fossil record? This is a figure from a creationists book showing how dino nests may have been preserved in a global flood. In our example here, those eggs would also have to be incubated for probably weeks and then the young dinos grew for weeks after that before then being buried by the rising waters. The explanation from some YECs is almost hard for me to type it is so unbelievable. Generally what is described is a global flood in which dinosaurs have run from one place to another to escape flood waters. What is important to note here is that for most young earth creationists a global flood didn’t entirely cover the globe all at the same time but covered only portions at a time. I guess there were large tsunamis that went around the earth bringing destruction in one place but allowing for some habitable land in others even during the 40 days and after. So dinosaurs managed to hang on for a long time and then after 5000 feet of sediments were laid down in Mongolia some of them quickly migrated onto the new sediments. Many of them were apparently pregnant and laid their eggs in tens of thousands of nests. Just hours or possibly days later the next wave of the global flood came and covered these nest and killing the adults. Apparently the last wave was a really mighty one since probably hundreds of thousands of dinosaurs had managed to survive the initial devastation and the deposition of thousands of feet of sediments but they had to all be killed by the last wave since only the ones on Noah’s ark could be said to have survived the flood. As challenging as this might be to believe, here we have an example that ups the ante on the elaborate and already unbelievable creationists explanation another 100 fold. Before us we have clear evidence of eggs that were laid, hatched and the dinosaurs grew for some time before being buried. And yet all of this still happened in the middle of a global flood! I don’t know what the incubation time of dinosaur eggs was but I doubt they hatched the day after they were laid so this probably means there were several months of time from nest-building to burial. But for young earth creationists this needs to have occurred far more rapidly since there are many layers of sediments exposed above these fossil nests sites. By their reckoning all these layers were also laid down well before the end of the flood year because they need the receding waters to erode the valleys that we see today that now expose those rocks with the nests in them. In addition, consider that preserved dinosaur eggs have been found on all the continents. So this Flood that was causing world-wide destruction must have had rather placid intervening periods on every continent where animals that had escaped all the initial destruction would settle down and attempt to reproduce before they met their apparent demise. Invariably I find that Christians only hear the about huge fossils finds from creationist organizations and they are only told about how these bones look like they were buried quickly but not given any of the other details. When exposed to the details of the fossil finds the generic explanation hold little value with respect to explaining how these collections of juveniles dinosaurs came to be fossilized. If young earth creationists were held to explaining the details of these eggs and juveniles bones I don’t think many would find their explanations particularly compelling. Some Flood geology models have suggested dinosaurs could have laid eggs between the surges of rising water, and indeed they could have. However, the fact that the inhabitants of this dinosaur nursery are “not neonates” makes that a doubtful scenario for this particular “nest.” Without knowing the growth rate of Protoceratops, of course, we cannot completely rule it out. Thus, the biblical Flood explains the preservation of this dinosaur “nest.” Genesis chapter 7 tells us that the Flood began when the fountains of the great deep opened along with the windows of heaven, in reference to volcanic activity and rain combining to violently cover the earth with water over a period of many weeks. The fossil graveyards of the Gobi with many creatures frozen in time were catastrophically buried in loads of sand dumped on them by violent winds and sediment-laden surges of floodwaters. Ultimately, water covered all, producing the characteristic cross-bedded striations typical of underwater sand-waves. The Upper Cretaceous layers are conventionally dated at about 70 million years based on unverifiable untestable assumptions from both radiometric dating methods and the evolutionary ages of the fossils in them, but God’s eyewitness account in the Bible tells us the Flood happened only about 4,500 years ago. This is what passes for an explanation? She does acknowledge that the fact that these hatched dinosaurs makes the egg-laying scenario in a cycling flood “doubtful” but then what is the alternative? Apparently the alternative is to say that we don’t know the growth rate of Protoceratops and thus “The biblical Flood explains the preservation of this dinosaur “nest.”” It is really hard for me to make any sense out of here explanation. It seems that Mitchell does find the usual explanation put up by YECs as a “doubtful scenario” but then she has no idea what to do with this story so she just tacks on a final paragraph about how the bible explains these nests. What follows is copy and paste stuff from standard line of other YEC articles that really don’t address the specifics of this particular set of fossils at all. *This post may sound familiar to some of you. This is an expanded an updated version of an article that I wrote in 2011 about these dinosaur nests. You left out a critical detail – the “mound” that the eggs were laid on itself had to be be deposited by the flood. Further complicating things is the fact that nests are found at multiple strata levels. Still further complicating things is the fact that fantastically high sediment transport rates are required just to deposit all the “early flood” and “late flood” layers. There’s no time for interludes between massively high sand waves sweeping across the land for dinosaurs to do their nesting activities. Oh yeah, definitely. 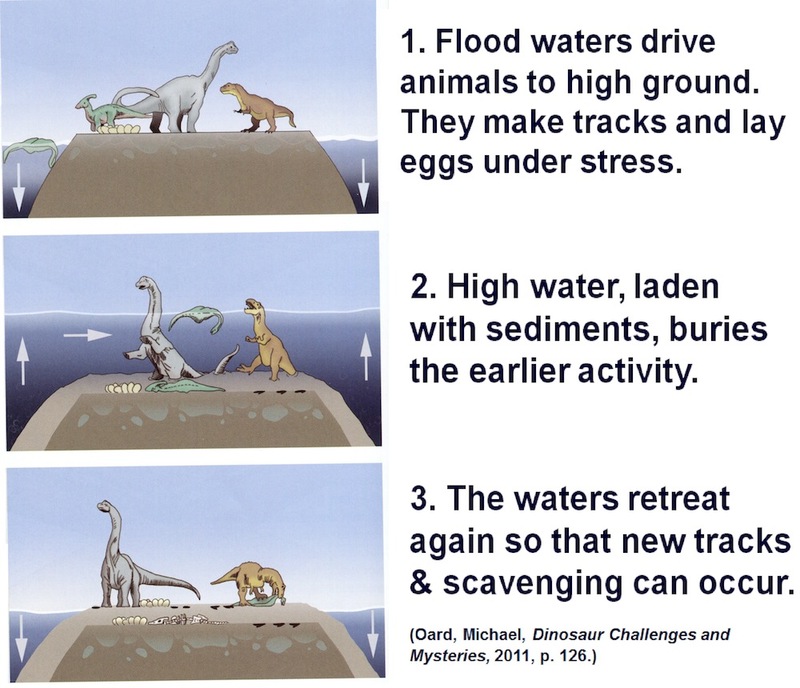 Even that graphic of Oards shows a mountain of sediment that the dinosaurs are standing on but that mountain wasn’t there at the beginning of the flood. So what were these dinosaurs running up to get away from the flood waters? Seems he thinks that dinosaurs could tread water for days at a time. Then all these nests ended up in just a small portion of the geological column that is dated to the same ages all around the earth. Everywhere they turn the YECs are going to find contradictory data but that doesn’t deter them from explaining it away. Again, a fascinating article. I appreciate how many quality articles you continue to put out. Keep up the good work, Joel. Thanks, I appreciate the encouragement. This one was a recycle job but its interesting to go back a few years and to see what I was thinking then and then do a bit more research and see if things have changed. Thanks for visiting my website http://www.popchrist.wordpress.com. I saw in comment that this post was “recycle”. It could have been written, today. Why because “there is nothing new under the sun.” Have you seen the latest discover of a snake with legs? I think one of fb friends posted it with the satirical comment that now Ken Ham and the AIG will claim to have evidence that before the fall snakes really had legs. Love the “quote”. That sums up the YEC argument right there. I wonder if you could comment on Mithchell’s claim that the cross-bedding is “typical of underwater sand-waves”. What is an “underwater sand-wave” and do they really leave deposits that look like dune deposits? On continental shelves where currents can be strong there are large underwater sand dunes that occur. As these are moved about my currents and storms they can produce layers and they can form a type of cross-bedding. So yes, superficially they can look like sand dunes from a desert. However, the distribution of sand grains is rather diagnostic between the two but more importantly, the types of fossils found in those formations are very distinct. In this case underwater sand dunes are made in relatively deep and definitely not shallow water and so the fact there are dinosaur nests found embedded in these formations does’t make sense if they were formed under water. If the ocean drained from an areas it would have eroded the dunes severely which would be easily identifiable in the parts that were preserved for us today. Some YECs try to show that some footprints could be made under water but again the underwater dunes are not in shallow water so the animals would have to be “walking” on these dune in very deep water and how their footprints would get preserved in never really said. And there are far more footprints than they would like to acknowledge these preserved dunes lack marine fossils which are found in under-water dunes. On land dunes after it rains and there is a crust of wet sand on the surface an animal can leave its tracks which then harden when it dries. New sand then can blow over those tracks and preserve them. It is unclear how this would happen under water.